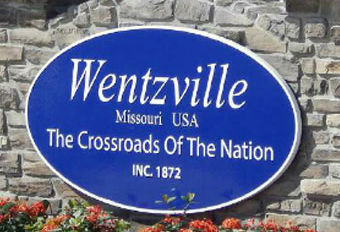 Monica Marsh is a realist and understood growth in the Wentzville area was inevitable when she moved into a subdivision near Route N four years ago. “Wentzville is going to grow, whether we like it or not,” Marsh said at a public meeting on Feb 21 at Liberty High School. “We never throughout we would have a highway through our backyard,” Marsh said. She along with more than 100 residents and area officials had gathered at a second public meeting involved with a study examining a nine-mile long, one- to two-mile wide portion of Route N from west of South Point Prairie Road to the Interstate 64/Route 364 interchange. That study may go a long way toward determining what that portion of Route N looks like in the future and what potential road improvements go there. Until a few years ago, Route N bordered farmers’ fields and pastures. The two-lane highway, built in 1960, now serves a growing residential and commercial area south of Wentzville. St. Charles County officials agreed in January 2018 to spend $1.5 million in county road funds for the study, which may help jump-start the process of making road improvements along Route N.
But three alternatives developed so far for those improvements outlined at the meeting had Marsh and her neighbors, the Menschers, a little worried about their impact on their property. Marsh said one alternative might take out property in her subdivision. Sheri Menscher worried that a 120-foot wide new Route N might end up 40 feet from her front door, which is worrisome because she’s already had a vehicle on the existing Route N run into her house and another into a pond behind it. Neal and Cynthia Menscher wonder if one of the alternatives will have an impact on their more than 100-year-old farm. Neal Menscher said the 218-acre farm has 150 acres still in use. Cynthia Menscher said the farm has been recognized by the state as a “Missouri Century Farm” meaning it has been farmed for 100 years or more. She said they aren’t yet worried but were at the meeting just to seek information, saying they weren’t aware of the study until recently. Residents in attendance were encouraged to write suggestions for Route N and to provide input on the three alternatives MoDOT and county officials say Route N has the potential to become more congested and continue to be a major growth corridor. The three alternatives outlined at the meeting are “Improve Existing Route N,” “Buckner Road Alternative” and “Near South Alternative.” A map also includes a “Near South Alternative’ and improvements on nearby Route Z. While nearby residents asked St. Charles County and Missouri Department of Transportation (MoDOT) officials at the meeting about the alternatives impact on their property, MoDOT official said they are looking at the route that will have the smallest impact on residents and the environment. A public hearing on a preferred alternative for the Route N area may be held this December and study will be completed in early 2020. But the question remains whether funding is available for a favored alternative.. MoDOT doesn’t have the money now and St. Charles County may be reluctant to tape into is road sales tax revenue. Both MoDOT and the county want the study in place when federal money becomes available.